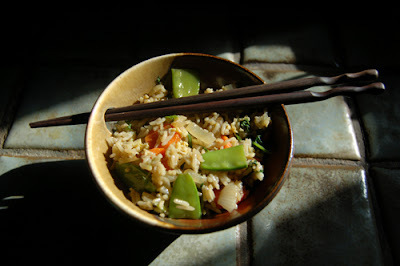 I recently redeemed myself after a disastrous attempt at making vegetable fried rice a few months back. The second batch of fried rice was delicious - both hot out of the wok and also cold out of a tupperware the next day for lunch. The failed first batch had a lot of problems but the worst of them was an overwhelming gelatinous quality. It was hard to tell if this was the result of gummy rice or the egg that was coating everything. I studied a few recipes online and realized what I'd done wrong the first time. I'd made two large errors that had doomed the rice from the start. Error #1: I'd used hot rice. Error #2: I'd tried to fry the egg in the wok with the rest of the ingredients. I found out that it is essential to use cold, pre-cooked rice so that the individual grains can be coated in oil and fried successfully. Warm or hot rice gets all stuck together and gluey, making it impossible to separate the grains. 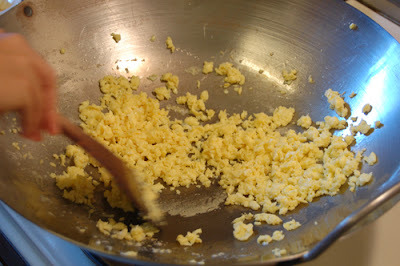 And I also learned that most recipes recommend frying the egg in the wok before you've added anything else, then removing it and adding it back in at the end of the stir-frying. With these two changes, it all went off without a hitch. I ended up cobbling together two or three separate recipes since I could not find one that included all the ingredients I wanted -- rice, eggs, onions, scallions, carrots, and snowpeas. Click here for a few helpful notes on stir-frying.